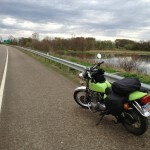 Last year, I began my motorcycle journey with a 2009 Yamaha Vino 125 scooter and then a 1973 Honda CB350F motorcycle. 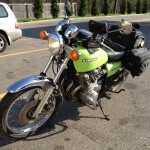 Earlier this year, I added a 1978 Kawasaki KZ650 to my stable. The scoot and CB350F are great fun, but aren’t really designed for a longer ride that I had started imagining over the Winter here in Ohio. 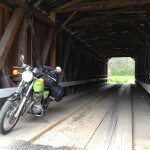 The KZ650, on the other hand, had the performance (and reliability) to make a multi-day trip. 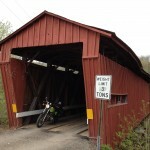 So I took three days off during the first week in April, and set out to ride through Ohio (and a little bit of Pennsylvania). 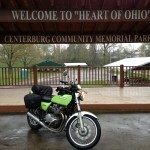 I even managed a stop at the Motorcycle Hall of Fame near Columbus, Ohio. Some very cold and wet weather, along with a number of thunderstorms, delayed most of my progress on the first day. Fortunately, I had plenty of tech to help me out, and was able to bring up the latest weather reports on my tablet to help avoid the worst of it. 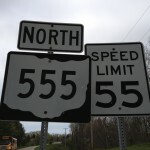 I was able to get onto State Route 78 and 555 on the second day. 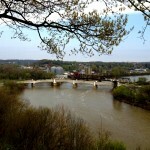 Both roads are filled with plenty of twists and turns, along with the hills and scenery one expects in southern Ohio. 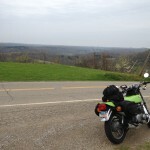 I was able to really enjoy the ride, and gained new confidence in all that I’ve learned over my first year as a motorcyclist. Towards the end of the day, I headed through West Virginia, and on to Pennsylvania, where I stopped at Pittsburgh for the night. The next morning, I gave into my geek side and visited the Carnegie Science Center before heading back up to Ohio. The map below shows my progress across those three days, but I like to think of it as a larger sign of the progress I’ve made as a rider. 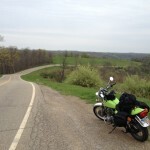 I definitely look forward to more opportunities to get onto the open road for some more motorcycle adventure.